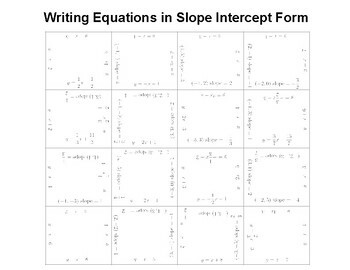 In this matching square puzzle, students will practice matching writing equations in slope intercept form given a point and the slope of the equation. Magic square, 9 square puzzle, square puzzle, cut up whatever you call it these are a lot of fun for students. The students solve each problem and match them to their corresponding answer to put the cut up square back together. These squares need to be cut out before class starts.